My childhood and adolescent years in suburban Bicton (between Fremantle and Perth WA) were set against a backdrop of Swan River estuary beaches, swamps, cliffs and caves. Many summer nights were spent fishing for tailor, flathead, and garfish. Our backyard included citrus, stone fruit, grapes, almonds, a vegie garden and a chook run. The Permaculture concept1Mollison and Holmgren, Permaculture One: A Perennial Agriculture for Human Settlements 1978 Corgi was the beginnings of a design system for sustainable living and land use, an environmental philosophy and a global movement. was birthed on the Hobart peri-urban forested footslopes of Mt Wellington where I lived and worked with Bill Mollison in the mid 1970s,2 See essay The Origins of Permaculture At The Edge in Collected Writings on a two acre property that was recovering from the great bushfires of 1967. From the site of the first “permaculture garden” only 3km from the centre of Hobart, it was possible to take walking tracks over Mt Wellington and be on a mountain spine of Tasmanian wilderness. I have lived most of my life at Melliodora, a one hectare permaculture garden farm situated within the village of Hepburn surrounded by the wild landscapes of the Hepburn Regional Park. All of these places are agriculturally productive low density suburban landscapes with edges to the wild. In 1978 long before the internet, the publication of Permaculture One and the Permaculture journal helped energise the “back to the land” movement that had been gathering in selected pockets of rural Australia for a decade or so.3The Sunshine Coast hinterland, NSW Rainbow region, and Central Victoria among others. But the greatest uptake of permaculture was in the suburbs, especially of Melbourne and Perth where individuals, households and local groups began mulching out their lawns, planting food trees, raising chooks and retrofitting their houses. During those years, ecological science, organic agriculture, agroforestry, passive solar design, appropriate technology, renewable energy, owner building, intentional communities and co-ops were all solutions being actively discussed in the community, at universities and even by governments. 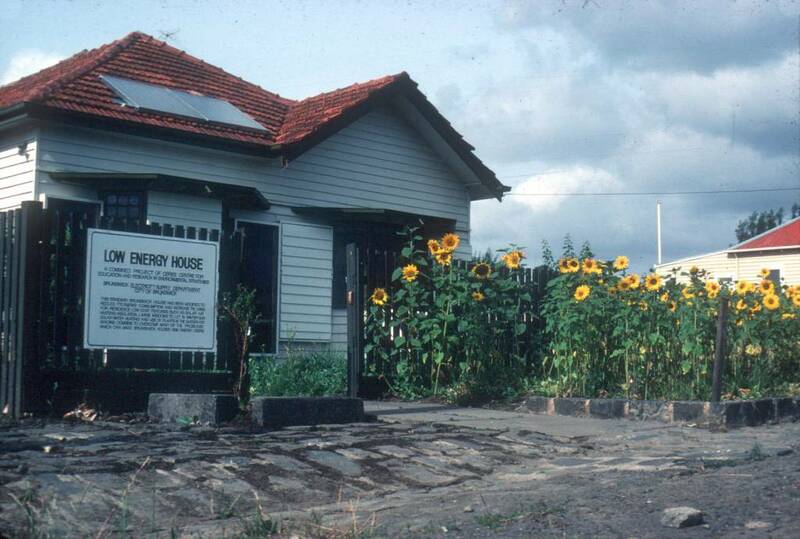 The transformation of a typical Brunswick weatherboard house into the CERES Low Energy Display Home in 1983 drew on the examples of retrofitting with a permaculture bent that had been spreading across Melbourne. In these cases, retrofitting applied to the biological as well as the built and technological fields. By 1983, the “Friedmanite Revolution”6Named after the economist who ideas informed what is euphemistically called “Neo-liberal” economic policies (even by its critics!) refloated western economies out of the “stagflation” of the 1970s.7The third world debt crisis that reversed the net flow of capital from rich countries since the end of colonialism and the “supergiant” oil fields of the North Sea and Alaska were also important factors in renewed growth of rich countries. The right wing think tanks that proliferated at the time claimed 'The Limits to Growth' report and concept had been proved wrong and the axe fell on energy research. The right wing tabloids blasted any alternative solutions as hippy nonsense while the left recast itself as managing economic rationalism with a human face. In Australia the election of the Hawke-Keating government promised moderate environmentalism and working people at the table of power but delivered free trade for global corporations, deregulation of the banks and the foundations for the speculative economy that followed. Permaculture was caught up in this propaganda assault that set back progressive responses to the Limits to Growth dilemma for two decades. The suburbs were not transformed and permaculture became associated with romantically naïve attempts at rural self sufficiency. When Su Dennett and I left Melbourne in 1985, the “greed is good” culture was accelerating and the feeling in the rural counterculture was of defeat, resignation and retreat to the city. The second wave of mainstream environmentalism that started to build in the late 1980s was partly a response to the scientific consensus on climate change, but the loss of faith in the culture of greed after the stock market crash of ‘87 was also a factor. The focus on the ecology of agriculture and food that had featured so strongly in the 70s was replaced by a focus on building, technology and transport. Agriculture, energy literacy and systems thinking were sidelined, as everyone wanted to get tech savy. Nevertheless the publication of Mollison’s encyclopedic Permaculture: A Designers' Manual (1988) and the docos In Grave Danger of Falling Food (1988) and The Global Gardener (1989) shown on ABC TV gave another boost to permaculture. In Melbourne there were insufficient groups, demonstration sites, courses and consultants to respond to the surge of interest across the suburbs. The explosion of computing power, the internet and cheap manufacturing in China gave credence to the illusion that the “weightless economy” of ongoing economic growth, with less consumption of energy and resources, was possible, and just around the corner.11For a debunking of this idea of “decoupling of economic growth from energy and resource use” see A Critique of Techno-Optomism in Prosperous Descent: Crisis As Opportunity In An Age of Limits by Samuel Alexander Collected Essays Volume 1, Simplicity Institute, 2015. The collapse of the Soviet Union had supposedly led to the “end of history” and the triumph of the market. Deregulation of the financial systems expanded the ways in which casino capitalism could create fake growth, including the acceleration of the building bubble – with the “green wash” of 5 star ratings for bigger houses with black roofs, no eaves and facing the wrong way12Solar orientation being incorporated in the 5 star ratings was specifically rejected by land developers because it would reduce “lot yield” in subdivisions. on smaller lots with no gardens. The genuine concern about biodiversity loss was used to justify natives only planting policies by local and state governments. Urban creeks, public parks and streets were planted to fire prone and water hungry eucalypts and short lived acacias that didn’t even provide summer shade, while food and functional deciduous trees were banished from the planting lists or added to the weed lists. Open spaces planted to native trees and shrubs and managed with herbicide provided another layer of green wash over the consumption landscapes of suburbia. Permaculturists became defensive about the use of naturalising species, as the nativist orthodoxy captured taxpayer dollars and volunteer sweat through rural and urban Landcare supporting the “war on weeds”. In the late 1990s I abandoned writing a book about the positive ecological values of naturalising species (Weeds or Wild Nature) to concentrate on what became Permaculture Principles and Pathways Beyond Sustainability (2002) because I thought the changes brought on by the confluence of peak oil and climate change demanded a clear articulation of permaculture, as ethics and design principles, adaptive to a world of energy descent. I felt the coming changes would sweep away nativism as irrelevant eco-fashion along with Monsanto’s energy intensive herbicides that have become the preferred weapon in the war on weeds. As my study of peak oil and resource depletion deepened and I revisited the Limits To Growth modeling, I concluded that the timeline for societal adjustment to these converging crises could be very short especially in the face of continuing denial of climate change, let alone peak oil. In 2004 peak oil blogger Adam Fenderson interviewed me about peak oil and permaculture, including a question about the future of suburbia.13http://energybulletin.net/node/524/taxonomy/term/10 Outside of the confines of Permaculture Design Courses, that interview was my first public articulation of a positive view of how the suburbs could be transformed by permaculture for energy descent futures. The context for this interview was the first popular documentary about Peak Oil called The End of Suburbia in which advocates of denser cities used the threat of peak oil to drive another nail in the coffin of ongoing suburban sprawl.14A few other peak oil aware commentators recognized the potential of suburbia to be adapted for a post peak world although I only became aware of them more recently. For example Jeff Vail, see http://www.resilience.org/stories/2010-10-31/rescuing-suburbia This documentary reminded me of the friendly debates I had had with colleagues15Most notably Nathan Alexander, a permaculture activist and urban planner responsible for some of the new urbanism informed planning in Melbourne. in the early 80’s about whether rebuilding of our cities at higher densities to reduce car dependence could provide the structural framework for dealing with the Limits To Growth conundrum, or whether the critical strategy for a benign energy descent was a permaculture retrofit and reruralisation of suburbia. Like the Weeds or Wild Nature issue, I found that my dissident views from New Urbanism16A movement to reform cities away from motor car dependence, strongly influenced by European urban development patterns. https://en.wikipedia.org/wiki/New_Urbanism orthodoxy would not get a hearing without a stronger voice. Another spinoff of the Heinberg/Holmgren tour was an invitation to contribute to a planned academic book Urban Energy Transitions21http://store.elsevier.com/Urban-Energy-Transition/isbn-9780080453415/ I started work on a manuscript that began with my new Future Scenarios concepts and flowed on to an explanation of why retrofitting the suburbs was one of the most effective strategies to adapt to energy descent futures. The deadline for the book passed but the manuscript continued to grow. After reviewing the text, permaculture colleague Adam Grubb (aka Fenderson) convinced me that the Future Scenarios part of the text needed to be published ASAP.22Future Scenarios website (May 2008) and later as a book My new role as a “futurist” left the suburbs text languishing much like the weeds book. While I was busy with the big picture of retrofitting the suburbs, unbeknown to me, permaculture pioneer Rosemary Morrow23Better know for her work training permaculture teachers here and in some of the poorest and war torn countries in the world. 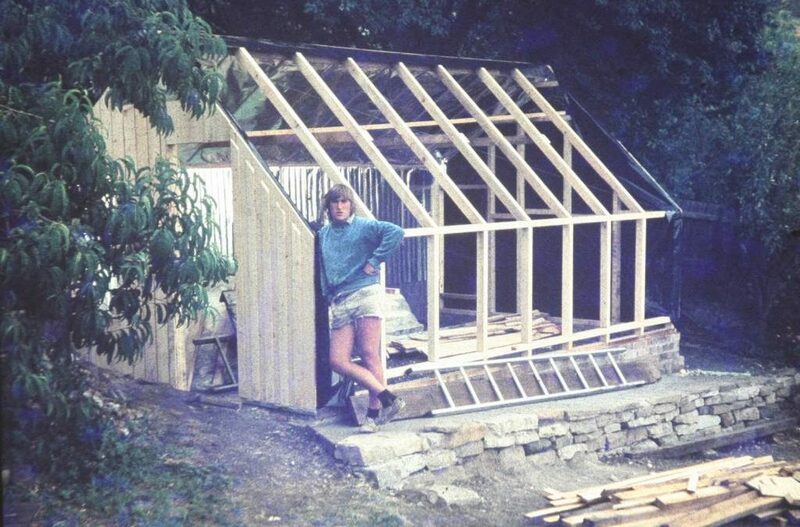 See her story in Permaculture Pioneers: stories from the new frontier edited by Kerry Dawborn & Caroline Smith, Melliodora Publishing, 2011. was retrofitting an unassuming brick veneer on a 700m2 block in Katoomba NSW. Her booklet and video A Good Home Forever (2009) is one of few guides for downshifting householders wanting to be more self-reliant, live well and minimize their ecological footprint. Meanwhile my ‘Aussie St’ narrative continued to grow and morph, developing a life of its own with names for the residents and in 2012 I added a near future scenario “The 2020 Second Great Depression”24First presented at the Wheeler Centre in Melbourne to reflect my growing understandings of the way in which bubble economics could be a much faster acting mechanism that would precipitate economic contraction as the first stage in a much longer and slower energy descent process.25Production of “Crude Oil” appears to have peaked about 2005 despite prices over $100/barrel and billions of dollars of new investment since. Unconventional oil, natural gas liquids, ethanol production driven by high prices and free money has allowed “Total Liquids” to continue growing for another decade. That bubble is now unwinding rapidly even if the so called “glut of cheap oil” continues, as economic contraction reduces consumption faster than depletion. For a review of peak oil symptoms and impacts see The New Economics of Oil: Energy, Economics and The Twilight of Growth in Prosperous Descent: Crisis As Opportunity In An Age of Limits by Samuel Alexander Collected Essays Volume 1 Simplicity Institute 2015. The Global Financial Crisis was the start of the process, providing an early warning for Australia still riding high on the resources boom that continued after the hiccup of the GFC. Nicole Foss’s writings at the Oil Drum website and later at The Automatic Earth blog had a big influence on my thinking as I shifted my lifelong focus on the energetic and ecological basis of human systems to understanding the role of money and finance. The same year Samuel Alexander from the Simplicity Institute in Melbourne invited me to write an essay about Retrofitting Suburbia,26An updated version Retrosuburbia Manifesto is at RetroSuburbia.com that included a meta analysis of Aussie Street to better explain some of the counter intuitive aspects to the urban densification debate. It was somewhat of a manifesto and, I thought a stepping stone to completing the languishing book on retrofitting suburbia. In 2014 I teamed up with Nicole Foss on a national speaking tour in which I presented the updated Aussie Street as the positive response to the challenging evidence about the emerging deflationary collapse of debt fuelled growth. In workshops for community activists I used the Future Scenarios work to focus on a range of “Brown Tech” mini scenarios; geopolitical oil shock, climate change natural disaster and property bubble collapse. These workshops generated some empowering insights; the same household and community level strategies that reflected permaculture ethics and design principles, were likely to be beneficial in all three scenarios. After the tour, my need to refocus on the book became stronger and early in 2015 I committed to making it happen. We discussed three potential books. The existing manuscript written for academics and activists that would aim to break open the urban sustainability debate was the first and most obvious book. The second was a handbook that would be directly useful to those already or seriously considering a DIY downsizing and retrofitting pathway. The third would be inspirational case studies of people and places that showed some of these solutions in action. Somehow the inspirational power of Aussie St had to be part of it. The central argument that suburban food producing capacity in garden and urban agriculture was a key factor in creative adaption of cities to challenging futures, had already shifted from slightly outrageous idea to a subject widely discussed by urban planning academics and activists. This quote from Zainuddin & Mercer27'Domestic Residential Garden Food Production in Melbourne, Australia: a fine-grained analysis and pilot study', Zainil Zainuddin & David Mercer, RMIT University, Australia published in Australian Geographer 2014. sums up the pivotal change that started around the same time as my refocus on suburbia. Given that such a significant proportion of the total area of Australia’s major cities is now accounted for by private outdoor spaces adjacent to residential dwellings, it is surprising that so little attention has been given to the value and use of such areas by urban researchers. Halkett’s (1976; Halkett et al 1978) pioneering work in Adelaide is a notable exception, building as it did upon his mentor’s celebration of Australian suburbia in the classic text, Ideas for Australian Cities (Stretton 1975). Yet, surprisingly this research interest effectively evaporated for some three decades until the simultaneous publication — in 2006 — of Gaynor’s excellent historical overview, Harvest of the Suburbs and Timms’s Australia’s Quarter Acre, Head & Muir’s (2007) Backyard—Nature and Culture in Suburban Australia a year later, and, more recently, Hall’s (2010) The Life and Death of the Australian Backyard. That food growing is an important function of private and public urban open space was now also the focus of one of the most energetic advocates of urban self reliance, Michael Mobbs, with his 2012 Sustainable Food companion book to his widely read and referenced Sustainable House. Garden and urban farming are definitely back on the agenda. I remain happy to engage in the debates, but I am more looking forward to the property bubble bursting, or any other crisis, to stimulate the huge opportunities for residents everywhere across the suburbs of our cities and towns to apply permaculture ethics, design principles, processes and strategies for a more resilient future. The more people have dirt on their hands while talking to their neighbours, the greater the chance that debates about a resilient future will be grounded in the abundance of nature and flexibility of human behaviour rather than what we have lost and who’s to blame. 1. 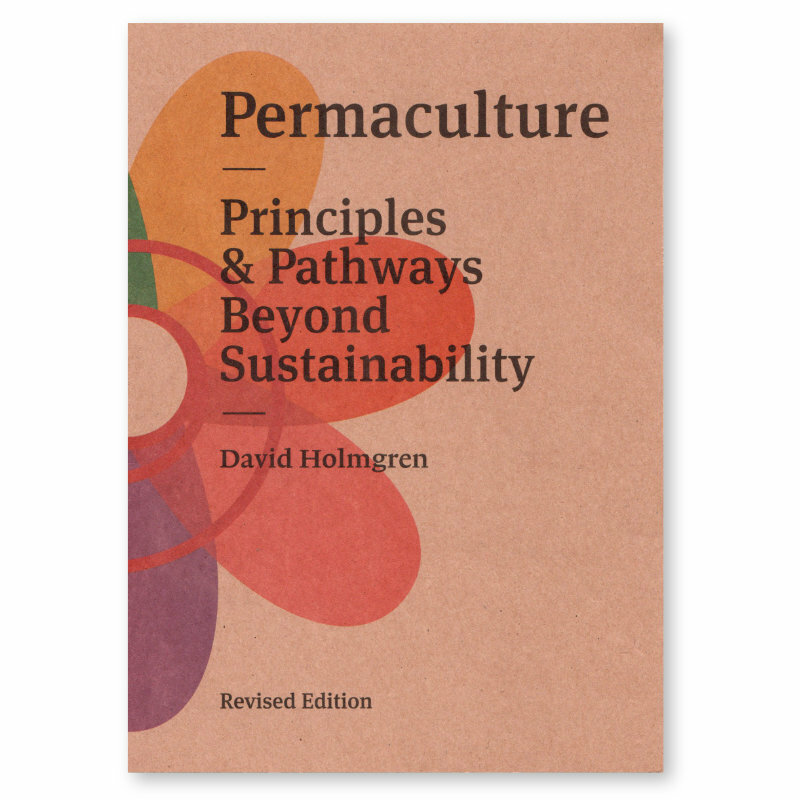 Mollison and Holmgren, Permaculture One: A Perennial Agriculture for Human Settlements 1978 Corgi was the beginnings of a design system for sustainable living and land use, an environmental philosophy and a global movement. 3. The Sunshine Coast hinterland, NSW Rainbow region, and Central Victoria among others. 5. In 1970 the Club of Rome, an international group of business, academics and political leaders commissioned a brilliant team of young systems researchers mentored by systems theorist J Forester at MIT to develop a model of the whole world environment and economy that could be used to test different global policies and outcomes over more than a century into the future. The Limits To Growth report suggested how continuing economic growth on a finite planet would play out without radical changes in the structure of the economy and society. The identified limits were both of resources and sinks (to absorb wastes). Controversial when released, it was catapulted into global debate by the oil price shocks of 73 & 79 that showed just how dependent the economy was on cheap and abundant energy from fossil fuels. The more slowly emerging concensus on climate change showed how the atmospheres role as a sink for greenhouse gases would have non-negotiable consequences. 7. The third world debt crisis that reversed the net flow of capital from rich countries since the end of colonialism and the “supergiant” oil fields of the North Sea and Alaska were also important factors in renewed growth of rich countries. 9. See Global Spin: The Corporate Assault On Environmentalism by Sharon Beder Scribe 1997. 11. For a debunking of this idea of “decoupling of economic growth from energy and resource use” see A Critique of Techno-Optomism in Prosperous Descent: Crisis As Opportunity In An Age of Limits by Samuel Alexander Collected Essays Volume 1, Simplicity Institute, 2015. 12. Solar orientation being incorporated in the 5 star ratings was specifically rejected by land developers because it would reduce “lot yield” in subdivisions. 15. Most notably Nathan Alexander, a permaculture activist and urban planner responsible for some of the new urbanism informed planning in Melbourne. 23. Better know for her work training permaculture teachers here and in some of the poorest and war torn countries in the world. See her story in Permaculture Pioneers: stories from the new frontier edited by Kerry Dawborn & Caroline Smith, Melliodora Publishing, 2011. 25. Production of “Crude Oil” appears to have peaked about 2005 despite prices over $100/barrel and billions of dollars of new investment since. Unconventional oil, natural gas liquids, ethanol production driven by high prices and free money has allowed “Total Liquids” to continue growing for another decade. That bubble is now unwinding rapidly even if the so called “glut of cheap oil” continues, as economic contraction reduces consumption faster than depletion. For a review of peak oil symptoms and impacts see The New Economics of Oil: Energy, Economics and The Twilight of Growth in Prosperous Descent: Crisis As Opportunity In An Age of Limits by Samuel Alexander Collected Essays Volume 1 Simplicity Institute 2015. 27. 'Domestic Residential Garden Food Production in Melbourne, Australia: a fine-grained analysis and pilot study', Zainil Zainuddin & David Mercer, RMIT University, Australia published in Australian Geographer 2014.